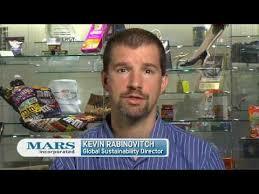 As a new RE100 leadership paper sets out guidance for companies everywhere to show leadership on renewable electricity, The Climate Group talks to Kevin Rabinovitch, Global Vice President of Sustainability, Mars – the first US company to step up and join RE100, back in 2014. Continue reading here. When RE100 reached its 100 members milestone one year ago, the nonprofit called on companies to engage their suppliers on renewable energy and produced a guide on how it’s done. llinois legislation concerning commercial solar valuation and installations on agricultural land has been signed into law by the governor. Enacted tax valuation and agriculture mitigation standards should help Illinois solar farms bloom. Martin Hermann of 8minutenergy, while at Intersolar North America 2018, took the time to sit down with pv magazine to talk about building the future. The company has an 8.5 GW portfolio of solar projects. For example, the study notes that Xcel’s subsidiary in neighboring Colorado recently reported solar PV costs in a range of $23 – $27 per MWh. Also published by Mountain Town News: Is Kit Carson’s renewable goal also the answer to rural America’s woes? Would this bill help coal plants or the solar industry? Environmentalists can’t agree, Palm Springs Desert Sun: Part of the USA Today Network. Assembly Bill 813 is a priority for Gov. Jerry Brown. The legislation would pave the way for a regional energy market involving as many as 14 western states, which would allow California to sell more solar power to its neighbors and import cheap renewable energy from other states, such as wind power from Wyoming. Provincial utility ​Ontario Power Generation (OPG) will spend almost $300 million to purchase Eagle Creek Renewable Energy LLC, which owns and operates more than five dozen small hydropower facilities in the United States. Innovative Charging Technology: A Portable, Convenient, Swappable Renewable Energy Source: Honda’s Mobile Power Packs, Core 77. The idea is that rather than having to plug in and wait while their bikes top off, end users can simply stop at a Honda charging facility, pull a nearly-empty battery out of their bike and swap it for a freshly-charged one. 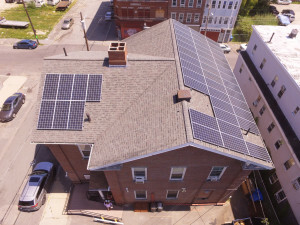 Bread & Roses, a community kitchen in the heart of Lawrence, Massachusetts, is keeping their energy local with their new solar panels installed by ReVision Energy from North Andover. The solar array, completed this past month, is a 6.7-kilowatt system consisting of 46 rooftop panels that will generate approximately 23,000 kilowatt hours per year while also offsetting 24,000 pounds of carbon pollution annually. ReVision Energy, an employee-owned company, was excited to partner with the local non-profit in an effort to transition away from fossil fuels and towards more socially-conscious, sustainable energy. This entry was posted in NewsBlog and tagged corporate procurement of renewable energy, corporate sustainability, energy lobbying news, energy markets, Energy Storage News, featured national solar example, Mars going 100% renewables, RE100, renewable energy news on August 17, 2018 by Helen Deffenbacher. 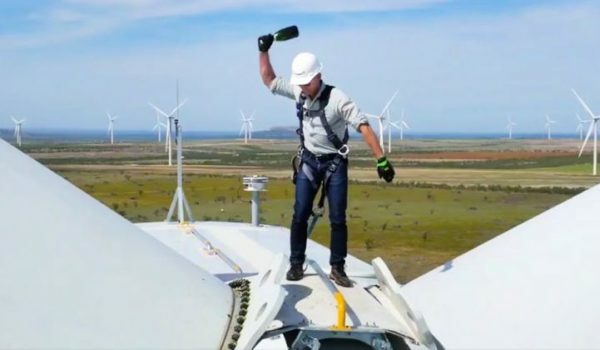 Click image to watch an AWEA video showing Amazon CEO Jeff Bezos smashing a bottle of champagne to launch Amazon Wind Farm Texas in October 2017. As of December 12, when heads of state joined to commemorate the second anniversary of the Paris Agreement, 327 major corporations, worth a cumulative $6.5 trillion, had committed to matching their emission reduction plans with the Paris goals through the Science Based Targets initiative. Another 864 companies have stated their intention to adopt a science-based target within two years . . . In addition, some 1,700 U.S. businesses from every state and of varying sizes — from Walmart to Wild Joe’s Coffee Spot in Bozeman, Montana — have signed the “We Are Still In” declaration. The initiative, which also includes cities, statehouses and college campuses, was intended to demonstrate America’s enduring commitment to delivering on the promise of the Paris Agreement. Click here to learn more. This entry was posted in NewsBlog and tagged clean energy financing, commercial solar, corporate sustainability, Electric Vehicles, global corporate renewable energy deployment, green tariffs, Nebraskans for Solar, RE100 Initiative, Science Based Targets Initiative, small commercial solar, U.S. Renewable Energy Map, We Are Still In-Largest Climate Action Network in the U.S. on December 29, 2017 by Helen Deffenbacher.